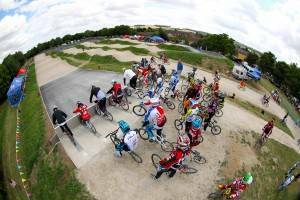 The Royston BMX Club was formed over 30 years ago to promote the sport of BMX Racing. Over the years, the Club has attracted members from across the region and is widely recognised as one of the friendliest clubs in the country. The club has its own race track situated in Burns Road, Royston, on land owned by the North Herts. District Council and is open for public use at all times the club is not using it. Club’s members take part in race meetings at Club, Regional and National or even International level. The membership covers a wide age range and both sexes, so everyone can take part – even Mums and Dads! 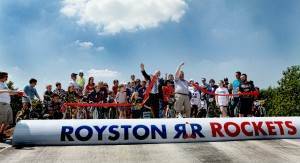 The Royston Rockets have qualified to be part of British Cycling’s Club Development Programme known as Go-Ride. It is aimed at improving both young riders and clubs and focuses on volunteers and young members – improving coaching standards and increasing the number of young riders with access to coaching activities. 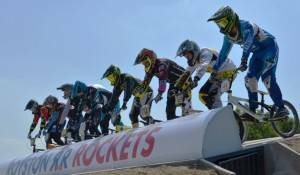 The Rockets have met certain criteria to enable the club to join the programme but along the way the club must continually work towards improving themselves and achieving ‘best-practice’ to maintain it’s Go-Ride Clubmark Accredited status. One of the main criteria for Go-Ride Accreditation is for the club to have British Cycling qualified coaches. They have attended a course on Safeguarding and Protecting Children, they have a valid first-aid certificate, and are child safety checked. Go-Ride is designed for a club that is determined to improve their club activities and management. One of the benefits, alongside better administration, is that Go-Ride helps increase youth membership and acts as a beacon to show that the Rockets provide a supportive environment for young members. Royston’s Go-Ride club coaching activities are designed to introduce young people to BMX, so whatever your age or ability, there’ll be something to suit your needs. As with any club Royston Rockets rely on the hard work of our volunteers. These volunteers include; Coaches, Club Contacts, and Club Welfare Officers. As a Go-Ride club we are offered training for volunteers to help build a supportive environment for young people, in which they can enjoy their cycling. Go-Ride clubs have something to offer everyone. They offer opportunities to ride, regardless of your age and ability, and opportunities to volunteer. There’s something for the whole family. The club tries to run regular committee meetings but many decisions on the development and progress of the club are made at club events at the track as they come up so that a wider range of opions can be sort from club members.